VENTURI AUTOMOBILES and CITROËN have won the european tender launched by La Poste (french postal services) with their Berlingo First Electric. 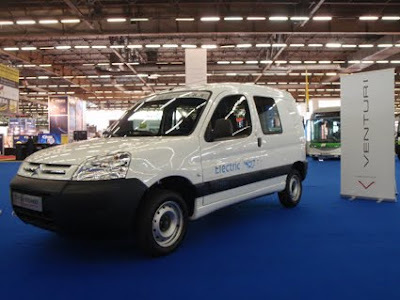 To provide its postmen with electric vehicles, and following several months of tests held under real conditions, La Poste will have 250 Berlingo First Electric “Powered by Venturi”. With the Berlingo First Electric “Powered by Venturi”, CITROËN is one of the first manufacturers to commercialise an entirely electric vehicle. “This decision reflects the strategy adopted by the Citroën brand, deliberately oriented towards concrete proposals for sustainable mobility, which will soon be completed by the arrival of the CITROËN C-ZERO,” declared Frédéric BANZET, General Director of Automobiles CITROËN. A spin-off from the fuel-based version, the Berlingo First Electric offers a charging capacity of 500 kg and charging volume of 3 m3. The electric power train is fully integrated beneath the hood at the front of the vehicle. Fitted with a three-phase asynchronous engine with maximum power of 42 kW, the Berlingo First Electric offers a range of 100 km and a top speed of 110 km/hr. 80% recharging takes 5 hours. These characteristics make it ideal for users of captive fleets, for whom these features are particularly well-suited. Delivery of vehicles for La Poste will be made in 2010.